A suspicious death investigation is underway in the Potomac Yard section of Alexandria after a 82-year-old man was found dead in his home. Holes were found in the side of the house. News4's Pat Collins has the story. 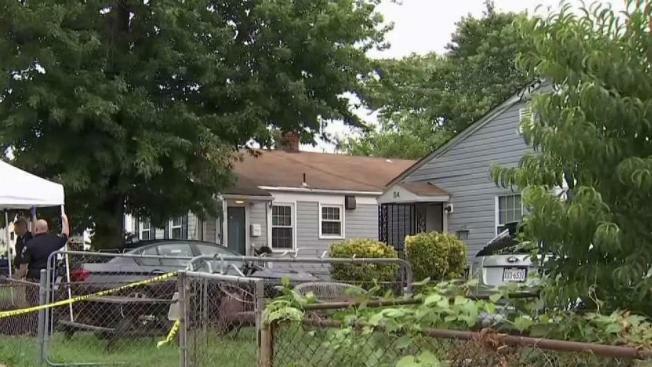 A homeless man has been charged in the death of an 82-year-old man found in his own home in Alexandria, police say. Dallas Smith, 31, of no fixed address, was indicted Monday on charges including murder and burglary in the death of Jerry Scott, Alexandria police announced. Scott was found with trauma to the upper body in his house on E. Reed Avenue, in the Potomac Yard area, on July 23. He was pronounced dead. Police found bullet holes on the outside of the house and categorized the case as a suspicious death investigation. Scott was a longtime resident, neighbors said. Smith has been in jail since July 25, two days after the killing, police said Monday. He was arrested then on a felony charge of obstruction. No additional details were released on how he was identified as a suspect. Police say Smith is a former felon who was not legally allowed to have a gun.